NorthEastFoto.com - Canon Speedlite Flash Buyers Guide - Which is right for me? All of the EX flashes use E-TTL (or E-TTL II). The EX units use a preflash system along with the camera's metering system to determine the best exposure for the scene. The older EZ flashes do not use a preflash, but rather measure the amount of light reaching the film. Since DSLRs don't have film, the EZ units are incompatible with any DSLR, except for in full manual mode. The Speedlites do not have a "fill flash" mode that you can set, like the Nikon flashes do (SB-800 for example), but the mode is built in. If you wish for the flash to be fill, then you set the camera in one of the creative modes... M, Tv, or Av. Then you adjust the metering for the background of the scene, and the Speedlite will take care of metering the subject and applying the correct amount of fill. If you wish for the Speedlite to be the primary light source of the scene, then you'd set the camera to P mode (or one of the preset modes... I don't use these so I don't know which ones would enable flash for primary light). There are currently 3 Canon general use Speedlites in production in the EX series - 580EX, 430EX, and 220EX. They all support E-TTL and vary in power and features. There are also three discontinued Speedlites in the EX series that can be a great value - 550EX, 420EX, and 380EX. The naming convention of the Speedlites roughly equates to their power. The guide number of all but the 220 maps to the model number, at 105mm - ex. 550EX has a guide number of 55 meters at 105mm. This applies to all the Speedlites except the 220EX, which has a guide number of 22 meters at 28mm. The 220EX is the smallest and least expensive Speedlite. It is small enough to fit in a shirt pocket, and reasonably priced at approximately $120. It has a fixed head (no tilt or swivel) and no power adjustments. It can't be used as a wireless slave Speedlite. This is an improvement over the built-in flash in that it gets the flash higher from the lens (reduces red-eye and lens hood shadows), and provides more power. The 380EX is a big step up from the 220EX. It has a head that can be tilted to bounce flash, but it can't swivel. The head also automatically zooms with focal length. The 380EX can't be used with as a wireless slave Speedlite. The 380EX was replaced by the 420EX (also discontinued). The 380EX sells for about $110 on the used market. The 420EX has a tilt, swivel, and zoom head. This allows for bouncing the flash whether shooting in portrait or landscape orientations, or bouncing off walls rather than ceilings. The head also zooms from 24-105mm. The 420EX can be used as a wireless slave Speedlite. The 420EX sells for approximately $175 on the used market and was replaced by the 430EX. 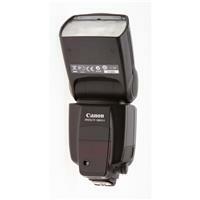 The 430EX is Canon's midsized Speedlite. It has a tilt, swivel, zoom head, just like the 420EX. The 430EX adds the ability to manually control the zoom and power. This allows for correction of the reported focal length on crop cameras (most DSLRs). It also has custom functions, faster recylcing times, and an LCD readout. The 430EX can be used as a wireless slave Speedlite. The 430EX sells for $240. The 550EX was the top EX Speedlite prior to the release of the 580EX, which has replaced it. It has most of the features of the 580EX, except for the white balance data and awareness of crop factor on DSLRs. The 550EX sells for about $290 on the used market. The 580EX is Canon's flagship Speedlite... most powerful and the most features. It has a tilt, swivel, and zoom head with automatic and manual zoom, like the 430EX. It can act as a wireless slave Speedlite, but can also be a master Speedlite. It has a stroboscopic mode which is a neat feature but something I've never used. The 580EX is aware of the crop factor of the camera its attached to (300D and later bodies), so that it correctly sets the zoom of the flash head. It has the ability to send color balance information that the body uses to make corrections in automatic color balance mode. It has more custom functions that the others, and can accept external power. The 580EX sells for $380. The popular Speedlite 580EX Flash has been replaced by the new Speedlite 580EX II Flash, which features a host of improvements, including a metal hot shoe withan improved locking mechanism for added durability, an external metering sensor for non-TTL automatic flash exposure control and a PC socket for use with non-dedicated slave triggers. Fully compatible with all EOS SLRs, the Speedlite 580EX II is gasketed for dust and moisture resistance, making it possible for users of EOS-1 class digital SLRs and many L-series EF lenses to use flash safely when shooting in dusty or wet environments. The ST-E2 is a compact hotshoe mounted device that provides wireless master capability for the Speedlite system. It can wirelessly control 550EX, 580EX(II), 420EX, and 430EX Speedlites, as well as MR-14EX and MT-24EX macro flashes. Like all of the components of the wireless Speedlite system, the ST-E2 requires line of site (or bounce) to the Speedlites it controls. It sends a flash pulse to the Speed lites to control them. The compatible Speedlites have swivel heads which helps facility flexible setup. The ST-E2 sells for about $210. The MR-14EX is a macro flash designed for close up photography. The MR-14EX has a guide number of 14 meters. It has twin circular flash tubes that are mounted on lens attached mount. The power can be evenly spread, or varied by a six-stop range from one lite to the other. The MR-14EX can also provide wireless master or slave Speedlite capability together with other Speedlites. The MR-14EX includes a control unit that is hotshoe mounted, and a cable attached head that mounts directly onto an EF 50mm f/2.5 Compact Macro, EF 100mm f/2.8 Macro (both versions), and MP-E 65mm Macrophoto Lenses [without filters attached] (can also be used with EF 180mm f/3.5L Macro USM via Macrolite Adapter 72C). It can also be adapted to other popular filter sizes with appropriate Macrolite Adapters; 52mm, 58mm & 72mm. The MR-14EX sells for $450. The MT-24EX is a twin head macro flash designed for close up photography. THe MT-24EX has a guide number of 22 meters. It has twin flash tubes that can be mounted on lens attached mount by default, or slipped off and placed on any hotshoe type mount, or even handheld. While in the mount, they can be adjusted to many different angles. Each head has a modeling lamp that can be setup to come on at the double tap of the shutter release on the camera body. The power can be evenly spread, or varied by a six-stop range from one lite to the other. The MT-24EX can also provide wireless master or slave Speedlite capability together with other Speedlites. The MT-24EX includes a control unit that is hotshoe mounted, and a cable attached head that mounts directly onto an EF 50mm f/2.5 Compact Macro, EF 100mm f/2.8 Macro (both versions), and MP-E 65mm Macrophoto Lenses [without filters attached] (can also be used with EF 180mm f/3.5L Macro USM via Macrolite Adapter 72C). It can also be adapted to other popular filter sizes with appropriate Macrolite Adapters; 52mm, 58mm & 72mm. The MT-24EX sells for $650.